Career Fair on Wheels – 2014 is a unique programme sponsored by Maharashtra State Board of Technical Education, Mumbai, with the joint venture of Directorate of Technical Education, Mumbai, and Organized by Pillai HOC Polytechnic, Rasayani. It is a novel programme to spread awareness among the society and students particularly about the technical education. Technical education plays pivotal role in the building of any nation. Country’s prowess rests on how much technical skilled manpower is available, with this aim a Career Fair on Wheels was organized by Pillai HOC Polytechnic, Rasayani at Schools near Rasayani. 10th and 12th standards are very important stage in the educational hierarchy as it prepares the students for higher education and also for the world of work. It is absolutely essential to strengthen this stage by providing greater access and also by improving quality in a significant way in students life, Young people need assistance in order to explore career possibilities and make important career decisions, but the world of work is more complex today thanever. They need far more guidance and information than did past generations, primarily because the hightech, global market economy is growing and changing so rapidly. Career development is a process of preparing children to make good decisions. Career Fair helps them to step forward to explore world of careers. After completion of diploma course students can be self-reliant as well as they can live dignified life. To feel this void career fair was organized. The programme not only gives the information about regular programmes but also gives detailed information about other vocational and professional programmes offered by MSBTE. At the same time, the programme also highlights various courses offered by Pillai HOC Polytechnic, Rasayani, which caters the need of the technical education in and around Rasayani and Raigad District, by offering state-of-the-art facilities and infrastructure at its deposal. It was Tuesday on 28th January, 2014 at 3:30 p.m., Netaji Palkar Vidyalaya, Chawk, Taluka – Khalapur, on both the sides hoardings of MSBTE and banners of Pillai HOC Polytechnic were put up. To response to the programme students of Netaji Palkar Vidyalaya were eagerly waiting for the guest to arrive and set acquire the knowledge they were about to impart. The programme was commenced at 3.30 p.m. with a warm welcome to all the guests. Prof. Sunil Patil, Anchor of the programme andintroduced the guest, experts to the audience. Followed by lamp lightening ceremony as a tribute to the Goddess of Knowledge, Saraswati. President of the programme Advocate. Avinash Deshmukh (President of Netaji Palkar Vidyalaya) inaugurated the function. The Guest speaker, Mr. Milind Aapte, started an interaction with the galaxy of students. In his speech he mentioned that one must select the career based on certain personality traits and acumen. For e.g. If a student thinks twice and try to fix the chain of bicycle if it slipped. It shows that student has mechanical bent of mind and he can excel in Mechanical field. It applies with electronics devices as well. Whenever any device cause any failure to function and if a student opens it and try to repair it. It means that a student is capable enough to opt for Electronics and Electrical engineering. This is also applicable when student thinks and search for the advertisement which is the best deal for him / her after comparing and contrasting the price and product quality. It shows that a student can really do wonders in commerce field or can be a future entrepreneur. He also advised students not to go for whims and fancy while choosing the career path. He explained it by giving the example of a bus Conductor as how he has a lot of money as well as every passenger obeys him while getting down. But, one should not forget that money does not belong to a Conductor. After this insightful talk the President of Netaji Palkar Vidyalya, Advocate Avinash Deshmukh, thank Pillai College and expressed his views by saying that we are fortunate enough to have in the vicinity a well renowned institute i.e. Pillai HOC Polytechnic, Rasayani, having world class and state-of-art facilities and educational infrastructure available for us in this down town area. So we have to make best use of it. At this juncture Principal Amar V. Mange explained and informed the students about the MSBTE approved courses offered by Pillai HOC Polytechnic, Rasayani. By this note the programme end up followed by distribution of snacks to the participated students. On 29th January 2014, cavalcade proceeded towards Krantiveer Vasudev Balwant Phadke, High School, Shirdhon, where elaborate arrangement was made and the pandal was set up with the decoration of garlands and flowers. The program began at 10:30 with the speech of R. D. Pardeshi, Asst. Secretary of MSBTE. He highlighted the various programmes offered by MSBTE and Pamphlets and leaflets of M.S.B.T.E. were distributed to each and every student present over there. At the outset of the programme the Guest speaker of the programme, Dr. Mukund Chitale, cited the example of the survey he carried out at his college. He set up questionnaire like, ‘what you want become in your life? Most of the students replied to the question that they want to become like Tendulkar or Amitabh Bachchan. In this case nothing is bad in becoming like someone or to follow someone, but we cannot like them. The reason is they have mark their presence, and it we copy someone, we will not get due recognition. Further, he added that take an example of Junior Mehamood, How many people know about him? Hardly few people know about him the reason is by mere copying one cannot get fame and due recognition. On the contrary, if you want success or fame be like yourself. Identify and recognize your own potentialities and what is utmost best in you. You are fortunate enough that you got legacy of the prominent personality who is famous in Indian history, a freedom fighter, known as the father of the arm struggle Vasudev Balawant Phadke. Now there is no need to take extreme steps as well as revolutionary measures. “Never tell your dreams, how many hurdles you have, But you definitely tell your hurdles that how big your dreams are”. Students welcomed the quote with a great applause. A sumptuous brunch was distributed to the students. The vote of thanks was proposed by Prof. Sunil Patil. The Second programme was scheduled at Chhatrapati Shivaji Vidyalaya Palaspe. The programme was commenced at 1.30 p.m. with a warm welcome to the guests. Prof. Sunil Patil, anchor of the programme introduced the guest and experts followed by a lamp lightening ceremony as a tribute to the Goddess of knowledge, Saraswati. 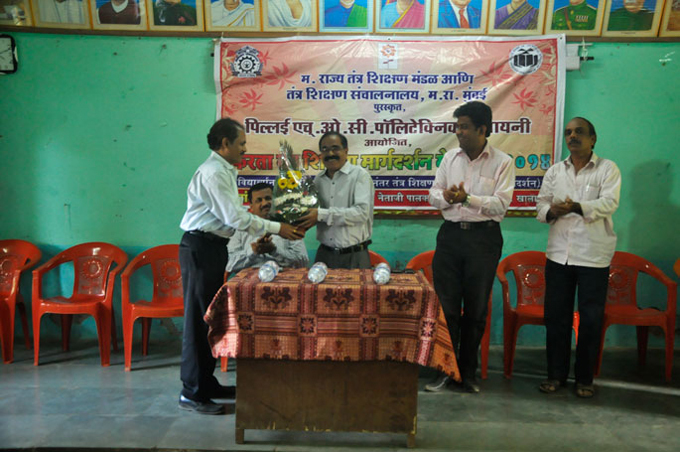 President of programme Advocate Mr. Ravindra Shravan Chorghe, (President of Chhatrapati Shivaji Vidyalaya, Palaspe, Taluka – Panvel) inaugurated the function. The guest speaker Dr. Mukund Chitale started an interaction with the galaxy of students. In his speech he mentioned that there are various career avenues are opened for the 10th pass out students like Printing Technology. After this note Principal Amar V. Mange address the students and very detailed information given about the courses offered by Pillai HOC Polytechnic, Rasayani. The programme ended with the vote of thanks followed by snacks distribution to students. The last venue of the program was Janata Vidya Mandir and Junior College, Aajivali, where, Principal Mukund Chitale, guided the students through his speech on various courses of M.S.B.T.E. One cannot be deprived of technical education with an essentiality of capital. The banks are easily providing educationalloan facilities and it can be availed without any hindrances. The program came to an end with a positive note to establish what career fields would best suit their interests. Snacks were distributed to the students along with the pamphlets and leaflets of the MSBTE and Pillai HOC Polytechnic, Rasayani. In the true sense of the term the programmes like Career Fair on Wheels spread awareness about the technical education in the rural places to maintain a strong visible presence on-campus and interact with students face-to-face to enrich career path outlines all the things necessary in education, experience, skills she / he must acquire to be qualified for a particular career. Career Fair on Wheels – 2013 is a unique programme sponsored by Maharashtra State Board of Technical Education, Mumbai, with the joint venture of Director of Technical Education, Mumbai, Organized by Pillai HOC Polytechnic, Rasayani. It is a novel programme to spread awareness among the society in general and students particularly about the technical education. Technical education plays pivotal role in the nation building of any nation. Countries prowess rests on how much technical skilled manpower is available, with this aim a Career Fair on Wheels was organized by Pillai HOC Polytechnic, Rasayani at Schools near Rasayani. It was a two day event held at Janata Vidyalaya Mohopada Rasayani, M. N. Nene High School, Pen, Private High School, Pen and Sarwajanik Vidya Mandir, Pen. As you aware, The Std. 10th and 12th are very crucial years in students life; this is the time when they should make an informed decision about their career. They are completely muddle headed where to go and which programme to opt for. Career Fair helps them in making such a decision so that they do not repent in future. After completion of diploma courses students can be self reliant in their field. To feel this void career fair was organized. The progamme does not give information about the regular programmes. It also gives information regarding other various vocational and professional programmes. It also depicts which are the various courses run by Pillai HOC Polytechnic, Rasayani and how it has state of the art facilities and infrastructure available. It was Thursday on 31st January, 2013 at 9:00 a.m., the pendal was set up with decoration of garlands and flowers, both the sides hoardings of MSBTE and banners of Pillai HOC Polytechnic were put up. To response to the programme students of Janata Vidyalaya were eagerly waiting for the guest to arrive and set to acquire the knowledge they were about to impart. The programme was started around 10:15 a.m. Prof. Sunil Patil Anchor of the programme introduced the guest and experts by welcoming them followed by lightening of the lamp to the Godess of Knowledge, Saraswati. President of the programme, Mr. Ramseth Mundhe (President of Janata Vidyalaya) inaugurated the function. In his inaugural speech he mentioned that we are fortunate enough that in the vicinity we have renowned institute i.e. Pillai HOC Polytechnic, Rasayani, having world class and state of the art facilities available for us in this down town area. So we have to make best use of it. After the President’s address Assistant Secretary of RBTE Mumbai thrown light on various courses run by MSBTE with their future scope and how students can make successful career in these fields. The Guest Speaker Principal, Shirbhate while addressing the galaxy of the students he focused on cult of the students and area of interest which plays important role. There is a lot of scope for technical education in to-day’s world. One cannot be deprived of technical education want of capital. The banks are easily providing loan facilities and we have to avail those. After Shirbhate’s speech, the other Guest Speaker Principal Deshpande proceed further. In his speech he explained about various courses run by MSBTE can be suit to your need. He further said that “In your life two people cannot cheat you, they are none other than your mother or father and your teacher”. So, take guidance from your teacher to make career in the interested field. He insisted on doing SWOT analysis as well. Program got over around 1:15 p.m., after that snacks were distributed to the students. Pamphlets and leaflets were distributed to the students. On 2nd February, 2013, cavalcade proceeded towards Pen, M. N. High School where elaborate arrangement was made. The program began at 10:30 a.m. with the speech of President Advocate Mangesh B. Nene (President M. N. Nene High School, Pen). Afterwards Principal S. G. Deshpande delivered the talk on career guidance. Pamphlets and leaflets of MSBTE were distributed to each and every student present there. The second program was organized at the same venue by the different high school from the same campus namely Private High School, Pen. Principal Shirbhate guided the students about the various avenues open to students of MSBTE courses. After that pamphlets and leaflets were distributed to the students at the end of the program. The last venue of the program was at Sarvajanik Vidyamandir, Pen, where, Principal Shirbhate and Principal S. G. Deshpande guided the students through their talk on various courses of MSBTE. The same arrangement was also made there. The program came to an end with a positive note. Pillai HOC Polytechnic, Rasayani organized one day program of Career Fair on Wheels on 23rd March, 2011 under the guidance and sponsorship of Maharashtra State Board of Technical Education. Inaugural session was carried out in the presence of Mr. Milind Apte, Pricipal Amar V. Mange, Prof. Chavhan, Head Master V. D. Yadav, Deputy Head Master T. G. Jadhav. Mr. Milind Apte addressed to the students who were gathered for the Career Fair on Wheels and gave the information about the various career opportunities available for the students who have passed 9th and appeared 10th exam. He also mentioned the career opportunities in technical field as well as Advertisement, Hospitality and Pharmacy etc. Before arranging this program prior publicity was done and information was given to the students and parents through Cable TV and also pamphlets were circulated through News Papers. Different stalls were put up including MSBTE stalls and our college stalls. Each stall gave information about various courses available at our institutes run by MSBTE. MSBTE stall gave information about various courses which are approved by it. Program was started at 10:30 a.m. after the inaugural session at Janata Vidyalaya, Rasayani. After that Career Fair on Wheels moved to the next destination i.e. Parner School, Vashivali where Prof. Chauhan addressed to the students regarding various career options available in Technical field. The last destination of the Career Fair on Wheels marched towards K.E.S.S.P. School, Apta, where Mr. Milind Apte guided students regarding various career opportunities in all the fields. Banners and Hoardings were displayed at important places to rush the students and parents to the program. At the time of program video shooting and photograph were also taken. In this way every attempt was made to make this program a grand success.